Twitter is a great tool to get to know people, expand your digital footprint, build up your credibility and develop a killer personal brand. Just remember that it all starts with being genuine and acting human. However if there isn't anyone to talk to, having a meaningful conversation is out of the question. So, basically, you need followers. Growing a large follower base may sound hard, but it's really not that challenging – all it takes is some planning and perseverance. And it doesn’t hurt that there are also many great tools to help you along the way. In this blog post I'll show you how to score your first 1,000 Twitter followers by using a few tools and your own skills. I’ll use my own experience, building my Twitter account from zero to 4,000 followers within a year, to draw examples from. In order to start developing your brand on Twitter, you need to have a very clear understanding of what your goals are and who you are trying to reach. For example, my primary aim with Twitter is to popularize my blog. I primarily write about digital marketing and want to reach the audience interested in this subject, so I have identified digital marketing, social media, blogging and content marketing as some of the most relevant keywords for my brand. I cannot stress enough how important it is to make sure you have the right keywords. Sometimes, you might think you know how people are talking about certain topics, but they might be using entirely different vocabulary. 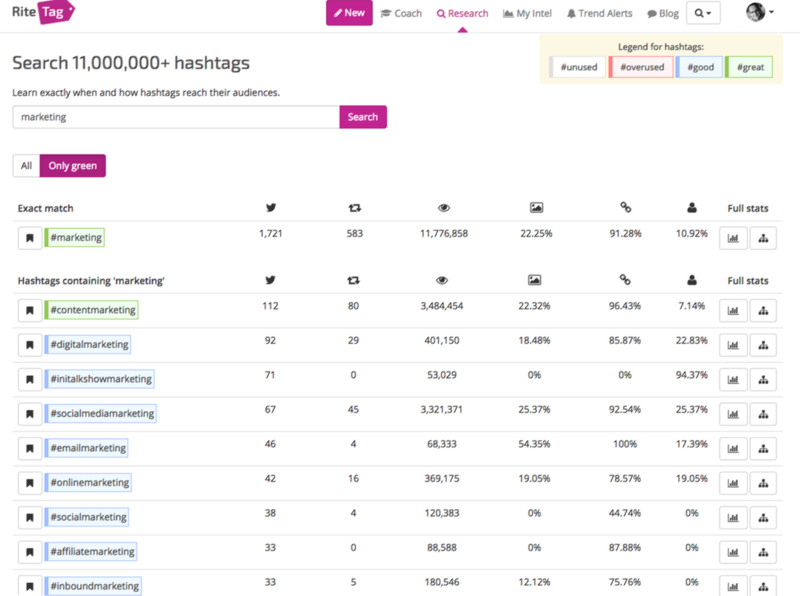 RiteTag is an excellent tool, which allows you to research and compare the popularity of Twitter hashtags and identify the best ones to use. I won’t be covering how to create your account in this Twitter blog post, so I hope you have already done this. What I will cover though is profile completion, i.e. filling in your Twitter bio, location and URL. Let's have a look at mine. Since I use Twitter as а platform to promote my website, I put the URL not only in the dedicated space for it, but also in the bio itself. As you can see the URL (and location) are not displayed in all views, so adding your URL to the bio might be beneficial (just make sure it’s visually appealing, i.e. not a shortened URL. Your bio is also one of the best places to target keywords relevant to your field of expertise. However, please do not forget to sound human – stuffing your profile with every possible hashtag that comes to your mind makes you sound like a bot and/or a spammer. Think about the people you'll be targeting. You want your brand to sound appealing to them, so add a quote or a quirky statement to show a bit of personality. Location is really important if your strategy focuses on a certain locale. Mention it in your bio, not just in the location section, (look at the comment on adding URL’s above). It can also be a great conversation starter. 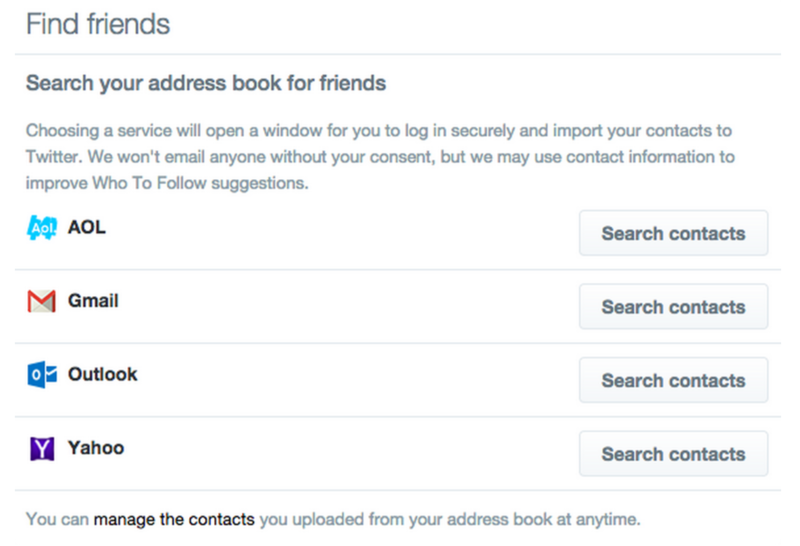 Finally, before you begin building a list of followers you don't know, scan your contact list for friends and family who use Twitter, and follow all of them. Twitter actually has a tool that lets you do this. Now that you are finished with your profile and have followed the first few people you want to target, it’s time to get to the core stuff. Drum roll… Time to reveal the big secret! The main point of this blog post all comes down to this: follow (many) people and some will follow you back. Easy, right? Not quite. There are quite a few pitfalls where your Twitter juggernaut can come crashing down. For example, you don’t want to follow too many people in one go (especially in the beginning), as it is very likely that Twitter will identify you as a potential bot and limit or possibly even delete your account. You’ve been warned. Apply the same measured and considerate approach described in the first part of this blog post, and you’ll set yourself on the path to success. Manual labor is not cool (especially when it comes to Twitter), but thankfully there’s a number of tools that will help you along the way. I recommend using ignitwit, not only because it’s free, but also because it adds a gamification element to your Twitter growth campaign, which serves two purposes. Don’t worry if you can’t follow many accounts at first. This serves to protect you from Twitter’s automated bot-detection systems. Keep coming back to follow your daily allocation, and soon you’ll get enough points to progress to a level with higher limit of follows and unfollows. This is the gamification element mentioned above. Ignitwit is a great tool because it is really focused on what it wants to let you do. Naturally, there are other tools, which provide additional features you might find useful. One common tactic when growing your Twitter base is to follow the followers of an account that you have identified as a competitor or supplement to your own. 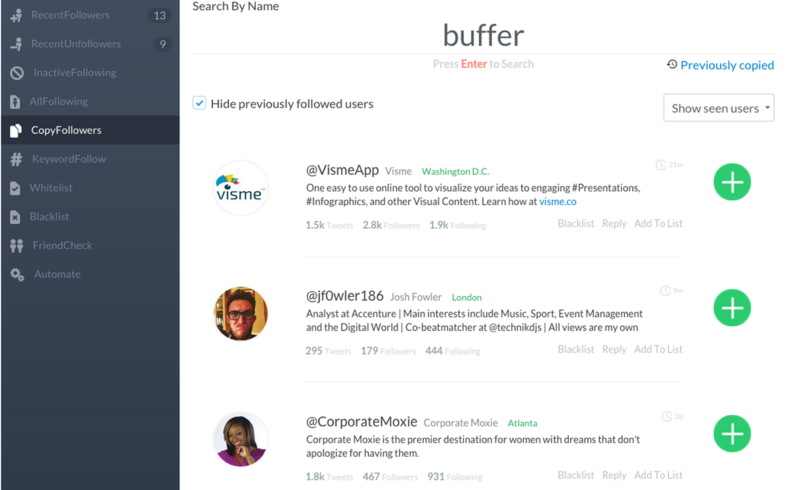 For example, in the early days of my account, I used this tactic with Buffer’s account as I thought that the people who were interested in Buffer’s content might enjoy mine as well. One tool, which allows you to do this is Crowdfire through their CopyFollowers feature. Crowdfire is a well-rounded tool, which allows you to see, at a glance, everyone you follow, people who don’t follow you back, as well as your fans, i.e. people who follow you without you following them back. Another really useful feature of this product is the ability to see your recent followers and unfollowers. There’s a bit of a philosophical debate on social media forums whether you should unfollow back everyone who unfollows you, but I’ll let you decide this for yourself. Your Twitter growth strategy should not end with mass-following people. As I’ve been repeating throughout this blog post, the essence of Twitter success is to appear human and approachable. Social media is inherently noisy, so don’t expect people to come looking for you. Instead, proactively execute tactics to engage your followers and start conversations. One of the native features of Twitter – Lists – gives you an opportunity to do this. Once you start following more than a few hundred accounts, you’ll quickly realize it’s hard to keep track of your timeline. Twitter Lists allow you to create an alternative timeline by segmenting the accounts you follow based on topics, relevance, or how close they are to you. For example, you may have a list for people you know in real life, and/or people who live in the same area as you. Create a list. You’ll use it to keep an eye on people you really want to add to your flock and engage them whenever there’s an opportunity to do so. This should be a key component of your strategy because engagement allows you to show your humanness. Keep adding more followers and monitoring your lists for opportunities to start meaningful conversations with people. Do not forget to keep a close eye on metrics – how many people follow you back, are they the right audience for you, what topics they’re interested in, etc. Test, and be prepared to revise any element of your strategy that you find needs tweaking. Above all, try to have fun doing it. Not having fun is the quickest way to start sounding like a robot, and, as I’ve mentioned a few times, this is guaranteed to hurt, not help, you. I hope you find this guide useful. 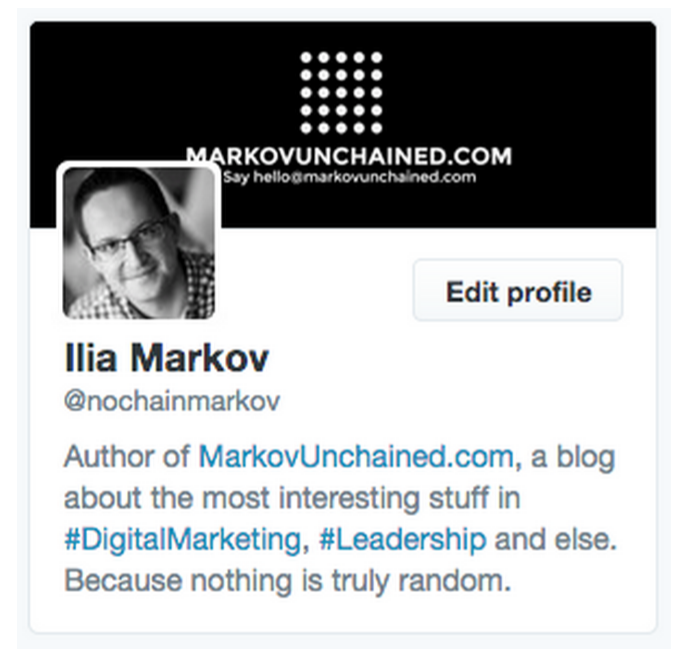 If you have additional questions, or disagree with anything I’ve written, you can always let me know @nochainmarkov. I’m looking forward to hearing from you.